Note: This procedure was performed on a 2000 Suzuki GSX-R750. All specifications mentioned in this procedure apply to this model bike only. Please refer to your service manual for specifications regarding your particular model bike. It is important that you read all steps at least once before starting work on your bike. Step 1 Remove the caliper spring by unscrewing two bolts. 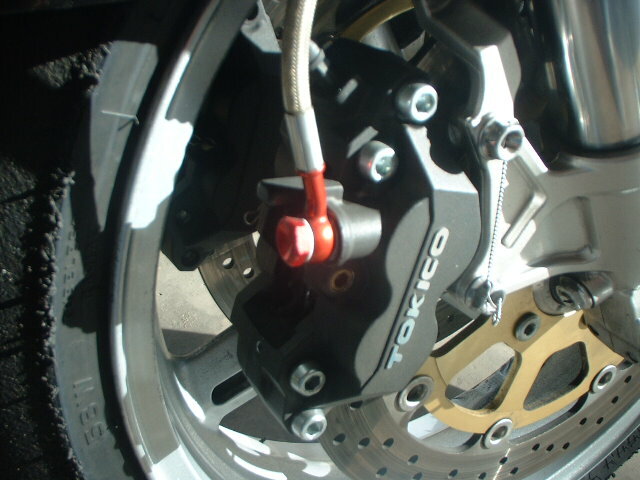 Remove the retaining clip and the pad mounting pin from the caliper. Step 2 Remove the brake pads from the caliper. 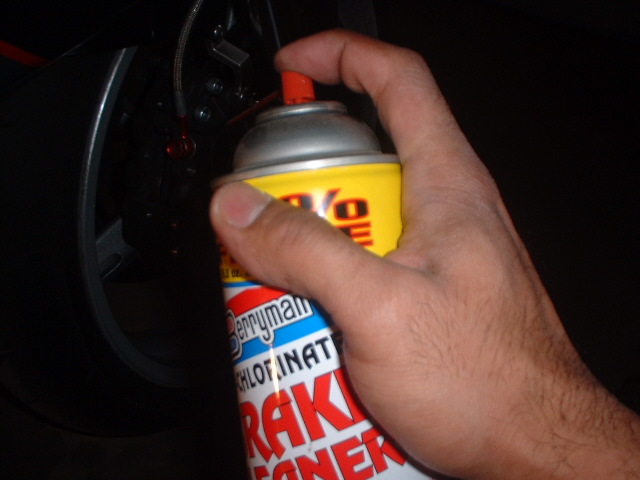 Step 3 Clean the brake caliper and pistons using a commercially available brake cleaner. Spray liberally and allow 2 to 5 minutes to dry. 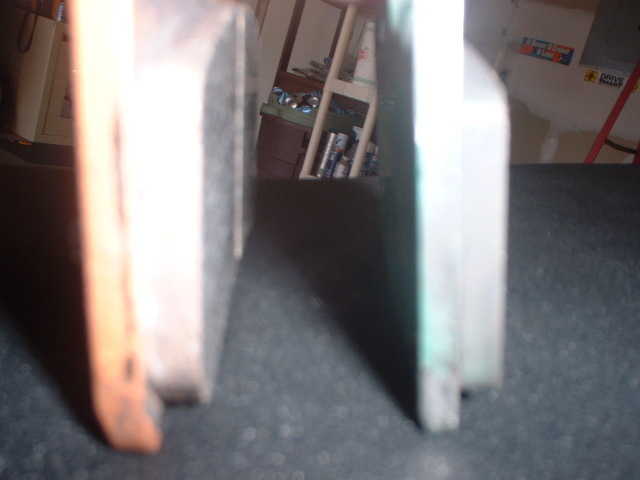 Step 4 New brake pads will be considerably thicker than the old ones. 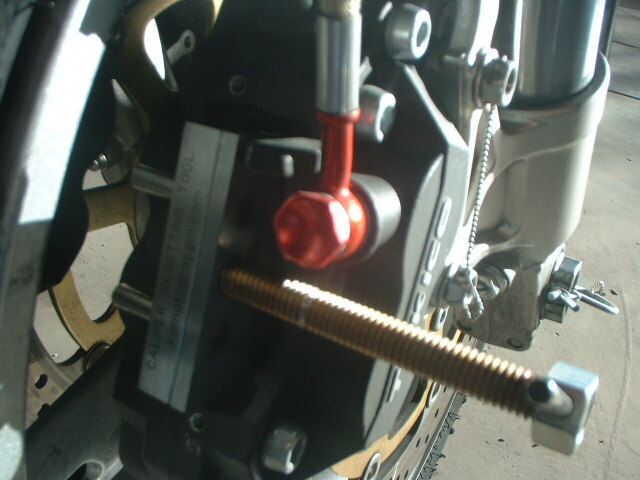 In order to install the new pads, caliper pistons will have to be pushed back. This can be accomplished safely and effectively by using the Caliper Resetting Tool. Using a c-clamp or a flat-tip screw driver will harm the delicate aluminum surface of the piston and affect brake performance adversely. Step 5 Set the Caliper Resetting Tool at its starting point by turning the handle counter clockwise. 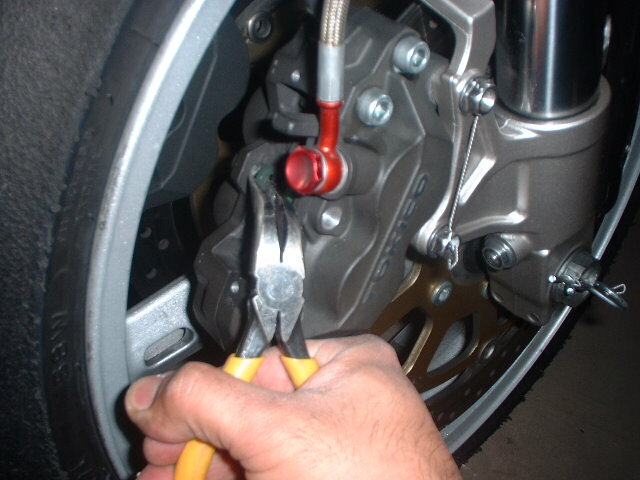 Carefully insert the tool into the caliper, making sure that no undue pressure is exerted on the brake disk. Otherwise the disk may get warped. The tool should slide right into the caliper with some careful maneuvering.